With changing Department of Transportation (DOT) regulations, our Essential Screens consultants have compiled suggested best practice for 2018. These updates are critical for employers to understand in order to avoid anything from fines to being shut down. Educate your managers and drivers on the new 49 CRF Part 40 regulatory changes. 49 CRF Part 40 regulatory changes define mandatory procedures when performing drug and alcohol testing in the workplace for the federally regulated DOT. Effective 1/1/18, your company DOT policy must be updated to reflect these changes. All affected employees must be notified of changes, in addition to the changes caused by the DOT Clearinghouse regulation changes, effective 1/5/17. If your driver(s) is currently on one of these prescription medications, have the driver speak with his/her physician to determine if there is an alternate treatment or medication. Employees who have a valid prescription and test positive for any of the opiate/opioid drugs will be required to be pulled from safety sensitive job duties for 5 days. DOT employers should update their job descriptions to make “the ability to operate in a constant state of alertness, and safe manner” an essential job duty and also include a pre-duty impairing effects prescription medication safety policy within their DOT policy. Prescription medication disclosure falls under the Americans with Disabilities Act Amendment. This policy should include medical marijuana as an impairing effects substance, even though it is not acceptable as a legitimate medical excuse under the DOT. 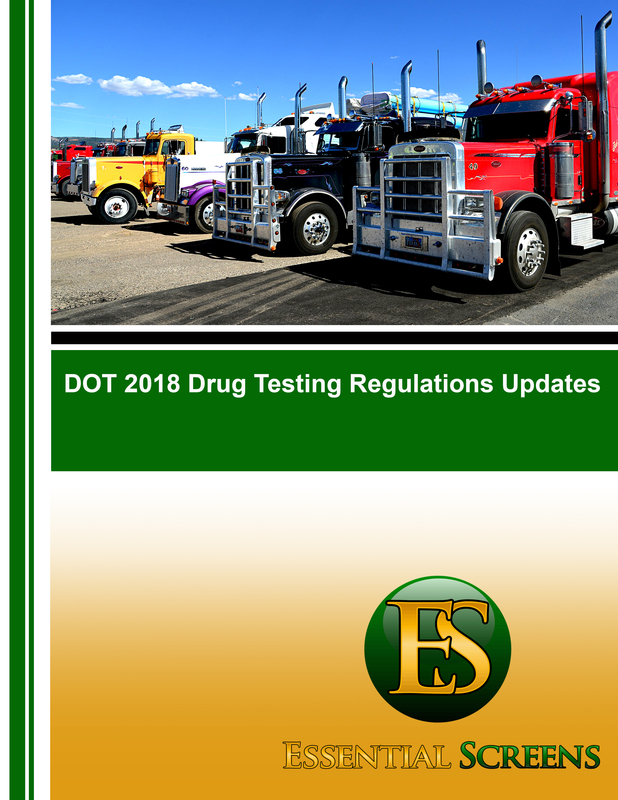 Essential Screens can provide a complete DOT Drug and Alcohol Testing Compliance Manual. Ask us about pricing.